Not that there's any other kind. The festive period isn't quite over yet, so while you still have a tree up (that is, if you put a tree up in the first place), here's a seasonal horror game featuring a murderous Furby doll. OK, so it's a 'Tattletail' rather than a Furby, but it's just as intent on tearing you limb from limb. The killer talking toy in question is the mythical Mama Tattletail, mother of the baby Tattletail you got for Christmas (and that you opened early because you just couldn't wait). Your reward for doing so is having to rush around your house, obeying the little creature's "mischievous" demands, while feeding, brushing and recharging your incessant, demanding toy. Make too much noise and you'll wake up Mama Tattletail, who legend has it once "ate a kid's eyes out". 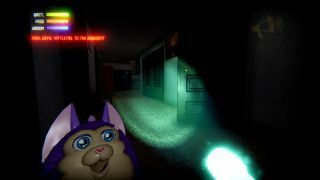 Tattletail is out now, developed by Waygetter Electronics, which includes the talented Ben Esposito of Arcane Kids fame.